High school principal said between 12 and 18 per cent of students are absent on a given day. With chronic absenteeism an ongoing problem at the regional high school, principal Sara Dingledy presented the district school committee with a revised attendance policy at their meeting Monday evening. “We need to get a handle on it,” Ms. Dingledy said, noting that a large percentage of students — between 12 and 18 per cent — are not in class on a typical day. Ms. Dingledy later clarified that the numbers refer to students who miss a class or more during the day for dismissal, are late to class, or are otherwise choosing to avoid classes, not students who are absent for the whole day. She said the number of students typically absent for the whole day is closer to 10 per cent, and that the number of absences is usually higher in the upper grade levels than lower grade levels. 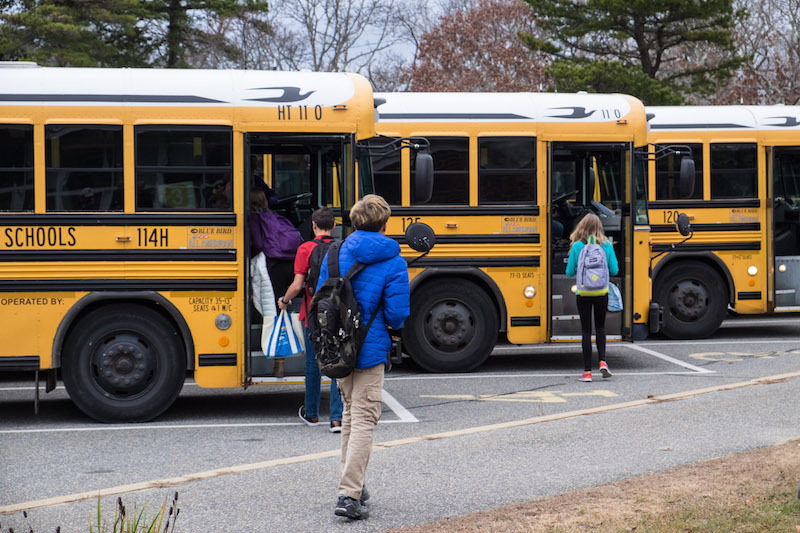 She added that when compared to other schools in Massachusetts, the high school’s rate of students chronically absent (defined as 10 percent of the time or more) is high. Last year, the rate was 16.8 per cent according to the Department of Elementary and Secondary Education. The state rate was 13.5 per cent that year. Ms. Dingledy said absenteeism increased following the removal of a stricter attendance policy five years ago. On Monday she presented the school committee with a first reading of a new attendance policy that aims to create clearer expectations and consequences for missing class. Under the draft policy, students who have more than 10 unexcused absences in one semester cannot earn full credit. Sporting trips and school field trips would not count toward the total, but certain parent-approved excused absences, such as bereavement and illness, could affect a student’s credit if coupled with multiple unexcused absences. The new policy also would require documentation for excused absences within 10 days. For example, seniors who miss school for a college visit must provide verification from the schools they visit. The committee will take a second reading of the draft policy at an upcoming meeting. Ms. Dingledy said later that the school is also creating support systems for students who need to catch up in classes. The school recently instituted a free period called flex time into the daily schedule. During that time, students can ask for extra help or make up work. Students can also make up work after school during so-called ACCESS time. She said they have also added more counseling resources for students, including counseling for those struggling with substance use. “The policy is more preventative than reactive,” she said. The new attendance policy is part of Ms. Dingledy’s initiative to revise the student handbook, including an updated code of conduct she submitted to the school committee for review Monday evening. In other business Monday, the committee approved a 2.25 per cent pay raise for nonunion employees including the principal, assistant principals and director of special education. Superintendent of schools Dr. Matthew D’Andrea presented a letter he drafted to towns asking if the school committee could retain community preservation funds for the high school track and field project, even though a three-year deadline for use of the funds approaches and the school has yet to break ground on a new track. Mr. D’Andrea also gave an update on the high school building committee. He requested that each town select a representative for the committee, which will begin looking at options for an overhaul of high school facilities. Four towns have selected representatives so far. A representative from the students for social and global change club asked if Columbus Day could be changed to Indigenous People’s Day in the school calendar. The committee agreed to look into the process for making such a change. The committee also approved a short list of resignation and retirement letters from staff as the school year comes to a close, including assistant principal Elliott G. Bennett, who will retire in November after 18 years as a teacher and administrator. School committee chairman Kris O’Brien added her own words of praise for Ms. Bennett. “I want thank [Elliott] for her service, for her leadership, and for all her years teaching,” she said. It’s probably at least partially the school’s fault if students are so poorly motivated that a fifth of them aren’t attending school each day. Yes, it’s also the attendance policy and a lack of consequences, but they also clearly don’t want to go to school and so there’s an underlying issue with the learning environment. These are public employees and when was the last time we got to see how much they make. We know every time they get a raise but how much do they make? I want to correct the numbers here a bit and make sure things are accurate. I apologize for not having the hard data in front of me at school committee. Upon reviewing our attendance trends over the past few months, I would say our daily absence rate hovers around 10%. Some days are higher, some days are lower. When you factor in dismissals and lateness, the percentage of students missing classes during the day increases--but not to 18% as I was quoted. Many of these absences are for cause, and that will still fall under an 'excused' absence. We are not looking to address those absences. Our goal in creating a clearer attendance policy is to reduce discretional and unexcused absences and have all students engaged in the school community.